Your confusion might be excused if you stumbled one morning last August into a conference room on the Georgia Tech campus. More than 50 people sat at eight tables. Most wore casual business attire. Almost all were design or construction professionals, planning the landmark Living Building at Georgia Tech. The unusual thing was that some participants were scrutinizing sticks, bones, shells and even an odd piece of sea sponge. Volunteers were walking around the room to dole out tiny spoonfuls of honey. And, at one point, the moderator soothingly urged everyone to close their eyes for a few minutes, so they could pay attention to the sounds around them. The LBC’s Biophilic Environment Imperative may be the building industry’s most formal adoption yet of a concept that has had a hard time breaking past the theoretical stage. Sonja Bochart is the biophilic design consult on the Living Building at Georgia Tech. Photo courtesy Sonja Bochart Wellbeing+Design. Biophilia is one of those concepts that brushes up against everything. Sight. Touch. Smell. Taste. Sound. All senses connect us to plants, animals and nature. The same is true for experiences: How we move. How we work. How we relax. We play all those roles in ways that relate to living systems. In the building sector, the concept evokes multiple, layered applications. “Biophilic design” can refer to a reliance on natural materials; to products or designs that remind us of plants or animals; or to designs that connect us directly to nature. Such ideas always have been with us. Classical architects fixating on designing structures that befit our core human nature. Engineers and builders have long mimicked the tricks of living organisms. Biophilic design consultant Sonja Bochart notes a key distinction, however. She sees her practice as grafting an intentional, scientific approach onto the art of incorporating living themes into buildings. “Happiness, satisfaction, overall well-being — there are proven links between those goals and specific patterns of living systems,” Bochart explains. While leading the Georgia Tech workshop in August, Bochart pointed to a landmark 1984 study by Roger S. Ulrich, which determined that surgery patients in rooms with views of nature recovered more quickly than those with views of brick walls. Ulrich’s study often is the first cited in a rich vein of findings about our evolutionary connection to the natural environment, and the impact it can have on our health and happiness: Our blood pressure drops when we look at animals. Plants lower stress levels. Natural light improves productivity and morale. Even before the Living Building Challenge adopted a Biophilic Environment Imperative, Bochart helped Richard Piacentini of the Phipps Conservatory in Pittsburgh to devise a biophilic strategy for Phipps’ Center for Sustainable Landscapes — a project that ultimately achieved LBC certification in 2015. That relationship yielded a slew of creative biophilic design applications, including a sound installation called “Of Earth and Sun.” Artist Abby Aresty spent months recording birds, wind, rain, insects and other natural sounds in Pittsburgh. The recordings were arranged into an “algorithmically generated audio collage,” which is amplified through the atrium’s windows via vibrations generated by tiny transducers. The result is a sort of subtle play on “surround sound.” It is very calming. LBC’s new biophilic imperative allowed Bochart to engage early on in the Living Building at Georgia Tech. Even with that start, some biophilic aspects of the building’s design were coming together before she got involved. The most obvious example is the building’s basic scheme, which calls for a huge porch and lots of windows that invite views of the university’s nearby regenerative landscape project, called the Eco-Commons. In terms familiar to many architects, the porch offers both “prospect” — because it provides an open view of the landscape to the west — and “refuge” — because it’s a protected zone. Those two features have been found in numerous studies to reduce stress, boredom and fatigue, and to enhance comfort, concentration and a sense of safety. Bochart says that’s part of the point. She wants architects, engineers, owners and builders to think about the intersection between overall design and specific biophilic features that can enhance the health and experience of occupants. 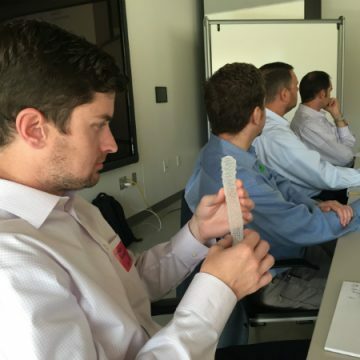 Andrew Pankopp of Long Engineering examines a “glass sponge” at the biophilic workshop. Photo by Ken Edelstein. The workshop she led at Georgia Tech was only her second since the imperative was adopted. And the building’s location on the campus of a major research university allowed Bochart to tap into some formidable brainpower. Jeanette Yen, a biology professor who directs the university’s Center for Biologically Inspired Design, helped her gather the show-and-tell artifacts for the meeting. Yen started a brief presentation by throwing a maple seed pod into the air, so that everyone could watch it whirl slowly down to the floor like a helicopter. Another biologist, Jennifer Leavey runs the Georgia Tech Urban Honey Bee Project. By the time she finished speaking and handing out spoonfuls of honey, the room seemed sold on planning an apiary on the Living Building’s roof, along with pollinator plants that would help to meet the building’s urban agriculture requirement. Another biophilic feature explored at the workshop involves the experience of entering the building. In a small-group exercise, several breakout tables came up with different versions of a similar idea: Install small runoff-fed rain gardens near the building’s southern entrance that would be tied to the building’s natural greywater treatment system. The architects also are planning what they consider to be biophilic feature inside the entrance. As visitors come into the building, their eyes will be drawn across the atrium by diffuse exterior light, toward extended views of trees and sky. Again: prospect and refuge. Live “bee cam” at the Urban Honey Bee Project’s existing apiary on the roof of Georgia Tech’s Clough Commons building. That’s true for the urban agriculture strategy, which under a landscape design by Andropogon of Philadelphia, stresses foraging and pollinator plants rather than annual crops. It’s also true for the choice of structural, exposed wood. From Gassman’s perspective, understanding the benefits of biophilic design is part of a dynamic that both enriches and challenges his practice of architecture. Bochart echoes Gassman’s thoughts on the tricky interplay between art and science. In a fledgling field, that’s particularly challenging because the expectations aren’t set and the standards aren’t fully understood by all participants. She’s working with Gassman and the rest of the design team to document the biophilic process for the Georgia Tech building. The cumulative impact of such documentation might begin to draw a roadmap for biophilic design on future projects. 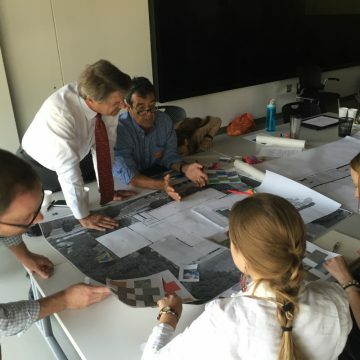 The Phipps Conservancy’s Richard Piacentini and landscape architect Jose Alminana confer during an exercise at the biophilic design workshop for the Living Building at Georgia Tech. Photo by Ken Edelstein. Ultimately, Bochart would like to see future LBC projects go a step farther. Touting existing studies that connect biophilic elements to health and wellbeing is a good start. So is documenting the design work on current projects. But more data is needed both to broaden the acceptance of biophilic design and to provide more guidance for its practice. Bochart hopes projects will build up case studies — based on surveys, interviews and physiological criteria — that gauge real-life outcomes. She says well-conceived metrics might provide evidence of the impact of specific design features on illness, mood, blood pressure and other variables. The Living Building community can expect to see the field refined. 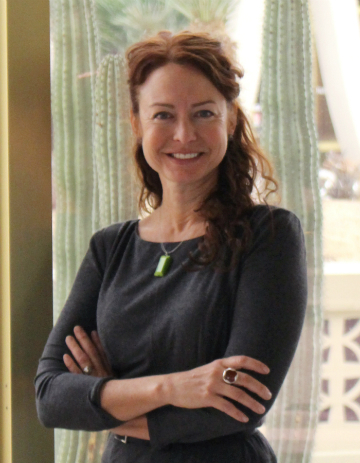 Last year, International Living Future Institute CEO Amanda Sturgeon launched the Biophilic Design Initiative, which “aims to achieve the goal of broad adoption of Biophilic Design among the design community, building owners and cities,” according to the ILFI website. Among its specific goals: connect projects to the scientists and resources that relate to biophilic design, and detail the processes required for the Biophilic Environment Imperative. 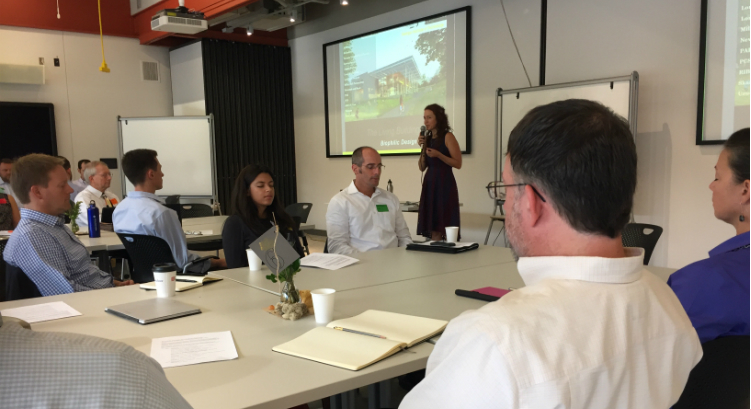 Bochart sits on the initiative’s Advisory Council, alongside other leading biophilic design advocates, such as the Phipps’ Conservatory’s Piacentini, University of Washington environmental psychologist Judith Heerwagen, and Catie Ryan and Bill Browning of Terrapin Bright Green. I find this subject interesting, even exciting, but would really like to see it get beyond the talk stage to something more real. Maybe that’s the Living Building being built at Georgia Tech. We live near Maya Centre, Belize, where our neighbors are trading their stick and thatch traditional houses for concrete block — superior in some obvious ways, but inferior in more subtle ways. We’ve bought an extra piece of land to create a small eco-resort to be operated by locals as a way for them to profit from the nation’s biggest economic driver, which rarely reaches our neighbors even though “things Maya” are something the industry promotes. Figuring out how to ensure the stick & thatch cabanas we build create a biophilic haven for visitors and locals alike will be a challenge. Getting from esoteric conceptualization like I’ve just read about to the ding-an-zich of making it real is the crux of our challenge. Please let us know when y’all figure it out.